"e;While our first thought was how no one we knew had enough money to lend us for a funeral, our second thought was more personal: We are just as broke as everyone else! In that moment, we realized that we did not want to spend the rest of our lives in that type of financial position. We knew we needed help, but we felt so helpless. We found ourselves doing a lot of praying and crying until J… esus answered. "e; (Excerpt from the book)The Hollingsheds know how it feels to desperately need money, but not be in the financial position to get it. Unfortunately, many people are experiencing financial problems. It is overwhelming, stressful, and frustrating being in debt and unable to pay bills. Financial problems are one of the main reasons for divorce, friendship demise, business failures, and suicidal thoughts. You are simply a manager of God's resources while you are here on earth. None of the resources that you spend so much time worrying about, stressing over, and chasing will make it into eternity. 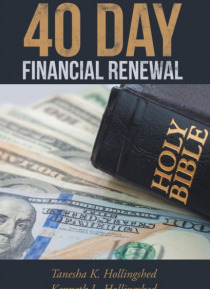 In 40 Day Financial Renewal, you will gain a practical understanding of Biblical stewardship and discover Biblical truths that will change your perspective about money and how you manage your money. You will be provided with financial worksheets as resources to assist you with budgeting, calculating your net worth, and financial management. It will equip you to make informed financial decisions, plan for your financial future, and leave a legacy.